Remember being told not to eat fat if you are trying to lose weight? That was perhaps the worst advice that you’ve ever been given. At Advanced Weight Loss Centers, we always recommend consuming heart-healthy fats like those found in olives, nuts, and avocado because they can help your body absorb nutrients, keep you fuller longer for successful weight loss and actually protect the heart. Health care professionals and scientists now understand that the type of fat you consume matters more than the amount to help prevent cardiovascular disease. For example, trans fats, and fats high in saturated fat are associated with higher levels of LDL (bad) cholesterol and total cholesterol, both of which are risks for cardiovascular disease (CVD). Unsaturated fats, such as polyunsaturated and monounsaturated fats have protective cardiovascular effects. We recommend replacing saturated fats with unsaturated fat. Monounsaturated fatty acids (Omega-9 fatty acids) go a long way in protecting the heart with positive effects on systolic and diastolic blood pressure. Plus, these healthy fats help improve insulin sensitivity in individuals with insulin resistance and healthy individuals. Monounsaturated fats, like those found in olive oil, avocados, nuts, and seeds can help reduce abdominal fat. All fats provide 9 calories per gram, however monounsaturated and polyunsaturated fats can have a positive effect on your heart and health, especially when it comes to weight loss. 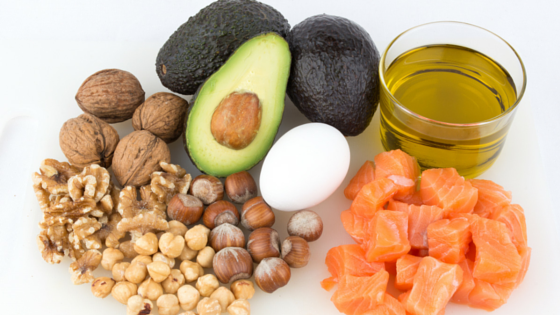 Polyunsaturated fats include both Omega-3 and Omega-6 essential fatty acids. They have been proven to decrease LDL (bad) cholesterol, improve blood pressure and insulin sensitivity. Good sources include cold-water fish such as salmon, trout, and mackerel as well as walnuts, almonds, and soybeans. Polyunsaturated fats are essential fats that your body needs but cannot produce by itself, so you must get these good fats through food. Both of these essential fatty acids are important for many functions in the body, including weight loss and heart health. You can train your body to burn more body fat for effective weight loss by including healthy fats in more of your meals and reduce your consumption of processed foods and sugar. Your body needs healthy fats in order to function and help you absorb Vitamins A, D, and E. In addition, they are vital for your nervous system. We always recommend choosing healthy fats and limiting bad fats for effective weight loss and a healthy heart.